China's astronaut corps are engaged in extensive training, in readiness for rendezvous and docking trials needed for space station operations. There is no doubt that China is on the move in space — including the country's own human spaceflight missions to Earth orbit — and at a time when NASA's own budget and big space decisions remain in the to-be-determined column. Last November, China accomplished its first unpiloted space rendezvous and docking test between the country's Tiangong 1 space lab module and a Shenzhou 8 spaceship. Follow-up flights to the space lab by crewed spacecraft are on the books, all in preparation for China to develop a larger space station in the near future — a major space project that could serve as a testing ground for human treks to the moon. The country also recently unveiled its blueprint for future space exploration in a white paper entitled "China's Space Activities in 2011," which was released in late December by China's Information Office of the State Council. In addition to taking a detailed look at China's space achievements to date, the report offers a glimpse into where the spacefaring nation appears to be headed. "I found this report the least clunky and bureaucratic of the Chinese space white papers that have been issued," said Joan Johnson-Freese, professor of national security studies at the Naval War College in Newport, R.I. "It provides relatively straightforward information that doesn’t require translation by a Sinologist, and an impressive list of accomplishments and goals." The national security specialist said that in reading the document, she was struck by several points. Firstly, "economic development" remains the umbrella rationale for space development in China, she said. The spectrum covered by that umbrella ranges from the very fungible increasing of Chinese “innovative capabilities” to the very practical "industry development." "The report includes an impressive list of accomplishments, impressive as much for the political will for success demonstrated as the technical achievements," Johnson-Freese said. Furthermore, the document notes that "guaranteed funding" through "multiple funding streams" is a goal, she added. "The Chinese do an excellent job in learning from others and I think they do not want to see themselves in NASA's position of having lots of good ideas, but more rhetorical political support than actual funding to follow through on those ideas," Johnson-Freese said. Under tasks, China's No. 1 priority is getting their heavy-lift Long March 5 rocket operational, Johnson-Freese noted. "Until that is done, all the other big plans will be on hold." Task No. 3, China says, is to "conduct studies on the preliminary plan for a human lunar landing." "This acknowledges the eventual intent to put a human on the moon … something most Americans have long assumed already officially approved and in the works," Johnson-Freese said. Also in the document, the Chinese provide an extensive list of international cooperation partners, with positive mention made of working with NASA, "though they are acutely aware of Congressional roadblocks in place to stifle any U.S.-Sino Cooperation," Johnson-Freese added. "Overall, this is a report they can, and I'm sure they do, rightly take pride in. It also tacitly points out the need for NASA to move forward with the Space Launch System. China is not doing anything the U.S, couldn't or hasn't done, but space development appears more important to China now than it is to the U.S.," Johnson-Freese concluded. "The Chinese emphasis on space for innovation and economic development ought to resonate as much in the U.S. as it does in China." 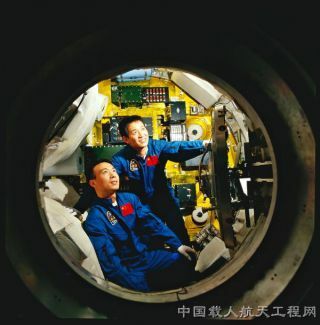 Zhai Zhigang waves the flag of the People's Republic of China from space, as his crewmate, Liu Boming, peeks his head out of the hatch. According to space analyst Marcia Smith, the president of the Space and Technology Policy Group, LLC in Arlington, Va., and founder and editor of the highly informative SpacePolicyOnline.com, there were few surprises in the latest white paper. "I don't see that the Chinese are announcing anything that we haven't heard about already… part of their steady, methodical approach to space exploration and utilization," Smith said. Smith said that, as for sending people to the moon, all the report says is: 'China will conduct studies on the preliminary plan for a human lunar landing. "No news there," she added. Smith has written an extensive review of the white paper at SpacePolicyOnline.com. In that appraisal, she said that "China issued such white papers in 2000 and 2006, and the 2011 version offers little that is new." According to Steve Eisenhart, senior vice president of the Space Foundation in Colorado Springs, Colo., is a recent visitor to China, where he met with officials from the China Space Agency and Chinese space industry leaders. "What is said in the plan is consistent with what we have heard and seen in all of our interaction with the Chinese," Eisenhart told SPACE.com. "They have a plan, and seem intent on executing it. From a purely Space Foundation perspective, we are happy to see the inclusion of engagement with nongovernmental organizations." Dean Cheng, a research fellow on Chinese political and security affairs at the Heritage Foundation, a conservative public policy think tank in Washington, D.C., also offered his thoughts to SPACE.com on the white paper. Cheng said he found it interesting to read the space document in conjunction with the speech that China's President Hu Jintao recently gave to representatives of the All-Army Military Equipment Development Commission. In that talk, Hu complimented them on their achievements in the last Five Year Plan, telling them that this would be the starting point for the new 12th Five Year Plan. As the Chinese space program is under the effective control of the People's Liberation Army, Hu's speech is arguably in line with the space white paper, Cheng said. "Note, too, that the second hallmark, after 'scientific development,' which is a Hu Jintao catchphrase, is independent development. This would seem to reinforce the importance of Chinese technological autonomy and 'autonomous innovation' or 'indigenous innovation,' another Hu hallmark and ideological legacy," Cheng explained, something that is again reiterated in "innovative development." "I think those who foresee a whole lot of international programmatic development with the People's Republic of China will be disappointed. China may cooperate with others, but not in technology development," Cheng said. China's Fengyun 2F weather satellite lifted off atop a Long March 3A rocket Jan. 13, 2012. In the document, the repeated references to high resolution Earth-observation satellites raises the question, Cheng said, of whether China is interested in developing sub-meter resolution spy satellites … and if so, whether it will also makes them commercial systems, competing against U.S. commercial imaging satellites and others. Cheng noted that there are extended references in the white paper to satellite applications. "Past Chinese economic analyses have noted that the money lies in satellite applications, and there's no reason to think the Chinese will miss out on that, if at all possible," Cheng said. Direct TV, Beidou handsets for China's version of the GPS, etc., are all mentioned, Cheng added, "and this is consistent with past Chinese discussions of needing to expand their commercial presence in this area." In the human spaceflight arena, Cheng said, "we now have a formal, official statement of interest in a manned lunar mission. This is huge, since the white paper reflects governmental buy-in from the entire system." On the whole, Cheng said that he doesn’t think the document offers too many surprises. "It is a reminder, though, that the Chinese link their space development efforts — among other things — to their five-year plans, hence the issuance of these white papers every five years,” Cheng said. For a look at the expansive white paper "China's Space Activities in 2011" visit this link.